The quality of peripheral blood mononuclear cells (PBMCs) isolated from whole blood has a significant impact on their subsequent analysis. Maximizing recovery, viability, and functionality of isolated PBMCs is essential to the reliability and consistency of downstream applications, particularly within cell therapy manufacturing. The standard method for purification of PBMCs is density-gradient centrifugation. It requires precise layering of whole blood over a density medium (e.g., Ficoll polysaccharide reagent from GE Healthcare), with careful pipetting of the floating cell layer after centrifugation. Analysts must take meticulous care throughout the procedure to keep from mixing layers before and after centrifugation. Newly available SepMate tubes from Stemcell Technologies can greatly reduce the time for optimal PBMC isolation from whole blood. But implementing them would require validation efforts to ensure that they perform equivalently to traditional Ficoll methods. Optimizing PBMC isolation methods is not the only critical factor in ensuring maximum cell viability. For storage, PBMCs ideally should be frozen at a controlled rate. However, the causes of post-thaw cell death have as much to do with the mechanics of thawing as those during freezing. Accepted methodologies for cell thawing are not standardized. Cells are often thawed by swirling frozen vials in a water bath or even a technician rolling them between his or her hands. Such methods introduce variability into both the temperature and rate of thawing, can introduce potential contamination, and even could have a serious detrimental effect on the viability or optimal function of cryopreserved cells. 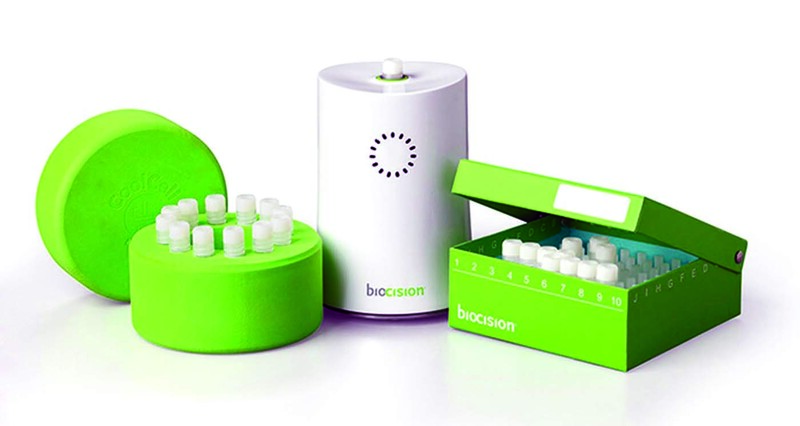 Driven in part by the US Food and Drug Administration’s (FDA’s) oversight into cell therapy, BioCision LLC has developed its ThawSTAR system for standardized, automated, cryogenic vial thawing. Controlled cell thawing ensures that extremely valuable cellular therapies are handled in a reproducible and standardized way. This provides assurance to suppliers that their products will not be contaminated or degraded in the very last step of a long and costly preparation and delivery process. Here, we compare two isolation methods for PBMC yield, viability, and subset frequency pre- and postcryopreservation, then compare postthaw recovery using two different thawing methods. The therapeutic potential of stem cells and other cellular-derived products to repair tissues and organs, treat diseases, and target malignant cells for destruction is being realized with increasing frequency both in laboratories and clinics. PBMCs are a cornerstone of the cellular therapy field because they represent a source of distinct progenitor-cell populations, each offering its own function and therapeutic prospects. The cells of the peripheral blood system are prized for their capacity to differentiate. Depending on the conditions under which they grow and proliferate, these cells can be induced to become blood cells, epithelial cells, and even bone cells — to name but a few (1, 2). Peripheral blood has an advantage over the other two leading sources of stem cells — bone marrow and umbilical cord blood — in that it represents a large, easily accessible source of cells that may be obtained with minimal donor discomfort and thus provide an easy source of autologous cells. PBMC cell-therapy applications are numerous. Lymphocytes derived from PBMCs are used to generate chimeric antigen receptor (CAR) T cells (3–5), which are currently under clinical evaluation as a treatment for aggressive leukemia and lymphoma. PBMCs also are used as the starting material for production of regulatory T cells used to treat autoimmune diseases, including Type 1 diabetes, graft vs. host disease, and Crohn’s disease (6–8). Monocytes from PBMCs are used to generate dendritic cells, which can be used to mediate antitumor immunity in cancer patients (9). In addition to their importance as a source of lymphocytes and monocytes, PBMCs are widely used in immunological assays to compare immune responses between healthy donors and patients (10) and to look for genotypic and phenotypic differences between normal and diseased immune cell populations (11, 12). Because PBMCs serve as a launching point for so many different cellular-based therapeutic applications, it is imperative that their collection, isolation, and cryopreservation all are geared toward maintaining the largest amount of viable, functional cells. Ensuring reproducible biological activity of these cells is inherently linked to the methods used to isolate and preserve them. Thus, it’s imperative that those methods be refined and improved continuously to meet the evolving demands of cellular therapies. Blood Source and Handling: Whole blood from healthy donors (males and females aged 30–59) was collected into 10-mL phlebotomy tubes anticoagulated with ethylenediaminetetraacetic acid (EDTA). PBMCs were isolated either immediately after phlebotomy or after 24-hour storage at room temperature. Before the isolation procedure, phlebotomy tubes were centrifuged and the plasma fraction removed. Those tubes were then divided between two technicians to carry out SepMate and Ficoll isolation procedures in parallel. 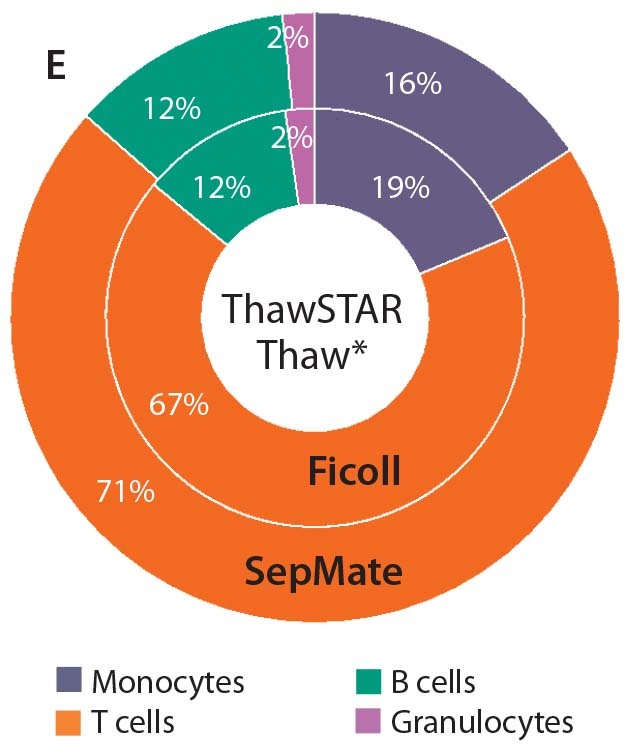 PBMC Isolation: PBMCs were isolated using SepMate tubes according to the manufacturer’s instructions (Stemcell Technologies). Briefly, blood is poured into the tubes above a barrier frit that physically separates the Ficoll density gradient medium from the blood sample. Tubes are then centrifuged for 10 minutes at 1,200g, after which the PBMC layer is poured off into a fresh tube and washed three times with phosphate-buffered saline (PBS). At the same time, PBMC isolation by Ficoll-Plaque density gradient also followed manufacturer’s instructions (GE Healthcare). Briefly, blood samples are meticulously layered over Ficoll and centrifuged for 45 minutes at 400g. The PBS medium layer is aspirated off, and the PBMC layer then is carefully pipetted into a fresh tube and washed three times with PBS. Cell Viability and Recovery: PMBC counts and viability for each isolation condition were measured using dual fluorescence staining and a Cellometer cell counter from Nexcelom BioScience. PBMCs subjected to cryopreservation were frozen at a rate of –1 °C/minute using a BioCision CoolCell controlled-rate cell freezing container with cryopreservation medium containing 10% dimethyl sulfoxide (DMSO) and 90% fetal bovine serum (FBS). Then cells were transferred to a liquid nitrogen (LN2) freezer for long-term storage. Recovery of viable cells were calculated as a percentage of the precryopreservation viable cell count. Leukocyte Cell Subset Frequencies: Using fluorescence-activated cell sorting (FACS), the cell subset frequencies were analyzed before and after cryopreservation for each isolation condition. These values are recorded as a percentage of the CD3+ parent population. Thawing Cryopreserved Cells: Frozen PBMCs stored in vapor-phase LN2 for at least four months were thawed in either a 37 °C water bath or a ThawSTAR cryogenic vial cell-thawing system. The system’s sensing technology monitors vial temperature to automatically detect solid-to-liquid phase change and produce a standardized thawing procedure for each cryogenic vial. After thawing, the PBMCs were subjected to yield, recovery, and cell subset frequency analysis as described above. Statistical Analysis: For statistical analyses of cell viability, yield, and recovery, we used Prism software from GraphPad. A nonparametric, two-tailed t-test helped us determine statistical significance. Leukocyte cell-subset frequencies were analyzed using flow cytometry with FloJo software version 8.8.7 from Treestar. for both PBMC isolation methods (results not shown) (n = 6). For cryopreserved samples, one vial from each of three donors was thawed for each condition being analyzed (n = 3). Isolation of PBMCs from Whole Blood: PBMCs were isolated from whole-blood samples of healthy donors using either SepMate PBMC isolation tubes or standard Ficoll density gradients. SepMate tubes contain an insert that provides a barrier between the density gradient medium to prevent gradient layers from mixing and permit faster, more robust PBMC isolation. We compared PBMCs purified from whole blood collected into EDTA-anticoagulated tubes and processed either immediately or 24 hours after phlebotomy. Viabilities were comparable (p > 0.05) for freshly isolated PBMCs from both isolation methods, with mean viabilities of 95% (Figure 1). Yield (postisolation viable cell count) of PBMCs from both methods also was comparable (p > 0.05). PMBC recovery (percent of precryopreservation viable cell count) after cryopreservation from samples processed either immediately or 24 hours after phlebotomy also was equivalent (Figure 2). for cells thawed in a water bath and using the ThawSTAR System (right) (n = 3). Leukocyte Cell Subset Frequencies: Using fluorescence-activated cell sorting (FACS) flow cytometry, we measured leukocyte subset frequencies isolated using both Ficoll and SepMate methods. Overall, we found no significant difference in PBMC subset frequencies between the two isolation methods. We also found no significant differences in leukocyte subset frequencies between isolated and cryopreserved samples or between cryopreserved cells thawed in a water bath and those thawed using the ThawSTAR system (p > 0.05) (Figure 3). Isolating PBMCs from blood stored for 24 hours at room temperature with either method led to significantly more granulocyte contamination. It has been well documented that granulocytes become activated over prolonged storage, which affects their buoyancy profile and compromises the efficiency of separation by density-gradient isolation (13, 14). 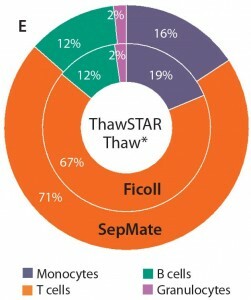 Figure 3a–d: Leukocyte subset frequencies are compared, calculated as a percentage of CD45+cells of PBMCs isolated by Ficoll and SepMate methods as measured by flow cytometry. Nosignificant differences were seen between T-cell, B-cell, and granulocyte subset frequencies whencomparing both methods of PBMC isolation and thawing (p > 0.05), (a–b) fresh isolates (n = 6), and(c–d) cryopreserved isolates (n = 3). Figure 3e: When thawing with the ThawSTAR system, monocyte subset frequencies were modestly higher than for PBMCs thawed using the water bath method (p < 0.01). Percentages also were more aligned with those of freshly isolated cells. Thawing Method Comparison: We evaluated the automated ThawSTAR dry-warming cell thawer for its suitability as a standardized thawing system for cryopreserved PBMCs. Cryopreserved PBMCs were isolated by either SepMate or Ficoll procedures, then thawed using either a 37 °C water bath or the ThawSTAR system. We also analyzed cell viability, postthaw cell recovery, and leukocyte subset populations for each thawing method. Most subsets showed no significant difference in frequency when thawed using either method (p > 0.05). We were interested to see a modest increase in monocyte frequency when cells were thawed using the ThawSTAR method (p < 0.011) and found that result to be more consistent with the monocyte-subset frequency of freshly isolated cells. Also of note is that the ThawSTAR method gave higher mean viable-cell recoveries regardless of the condition being tested (Figures 1 and 2). When compared with a water bath, ThawSTAR cell thawing showed statistically equivalent percent recovery of PBMCs with lower vial-to-vial variability (as denoted by shorter error bars). Cells and tissues are the critical raw materials upon which cell therapy is based. So the importance of their quality and integrity cannot be overstated. Cells are a discrete unit of a biological organism, and their mode of action is inherently more complex than other therapeutic agents, giving them an intrinsic variability that never can be truly eliminated. To eliminate what variability we can, it is therefore prudent to assess protocols for handling these cells periodically with an eye toward both optimization and standardization. The method by which PBMCs are isolated for clinical and preclinical studies naturally will influence the outcome of their downstream assays and applications. Although the traditional method of isolating PBMCs from whole blood with a Ficoll density gradient is validated and well-characterized, it is also tedious and time-consuming. The meticulous attention required to prevent mixing of density layers at each step can invite user error. SepMate isolation tubes offer a quicker, more streamlined method of isolating PBMCs, and our validation efforts herein prove that they can be a viable alternative. Use of SepMate tubes reduces the time and care needed for PBMC recovery, which in turn will mitigate the capacity for user error and help reduce variability in downstream results. It’s important to note that the tubes performed admirably with both cryopreserved and freshly isolated cells, so the SepMate method should prove to be no barrier to the strong practical need for storage and banking of therapeutic cells. In many cases, the availability of cryopreserved cells (stem cells in particular) is prerequisite to the practical treatment of disease using cell therapy. Significant time and effort has been spent on optimizing freezing protocols and cryopreservation media. The goal of such work has been to prevent formation of extracellular ice crystals during freezing, thus limiting cellular stress and structural damage. Precise recommendations on freezing rates, temperatures, and cryoprotective media have been worked out for many different cell lines, including PBMCs (15, 16). The scientific community has reaped clear benefits of the resulting increases in cell viability and recovery rates. However, current protocols for thawing cryopreserved cells are neither standardized nor optimized. It has been shown that one major cause of postcryopreservation cell death is actually ice recrystallization during thawing rather than ice crystal formation during freezing (15). Repeated freeze–thaw cycles, uneven thawing, and thawing rates that are too slow can allow tiny ice crystals to form, aggregate, and grow to a point at which they can fatally damage cells or add cellular stress that can activate apoptotic pathways. Clearly, the process of thawing cryopreserved cells would benefit from the same standardization and attention to detail that the process of freezing cells has been given. The current accepted method for thawing cryopreserved cells is to place cryovials in a 37 °C water bath (often a communal water bath) until a researcher judges their contents to be thawed. Not only is the thawing endpoint subjective, but the water bath itself incurs a risk of contamination. Thus, standard operating procedure in a clinical laboratory — or any laboratory following good manufacturing practice (GMP) requirements — either prohibits the use of water baths, or requires that they be emptied and cleaned after every use. The ThawSTAR automated vial-thawing system is water free, with a footprint small enough to fit inside the average laminar-flow hood. If wiped down with alcohol, the system can be used multiple times without recleaning. Our study represents the first time (to our knowledge) that an automated, hands-free, water-free system has been validated for thawing cryopreserved PBMCs. Such a system can offer significant advantages to the cell therapy industry. Perhaps most important is the standardization it brings to the process of thawing cryopreserved cells. Precisely controlled thawing rates should help eliminate the dangers of ice recrystallization during thawing, making cell recovery results more reproducible. The ability to use this system inside a tissue-culture hood allows cell thawing to be carried out in a sterile environment without repeated trips to and from a water bath. Use of this automated cell thawer could help streamline processes by eliminating the need for emptying and recleaning water baths after every use. The methods described herein validate two new technologies that should refine and improve current methods for isolating and preserving peripheral blood mononuclear cells without affecting yields, viabilities, or cell-subset population profiles. In addition to providing a newly validated method for thawing cryopreserved cells, the introduction of an automated, controlled-rate thawing system represents a paradigm shift toward a more standardized approach to the production of cell-based clinical products. We believe that such an approach will become more of a necessity as the cell therapy field matures toward mainstream clinical practice. 1 Li H, et al. Biological Characteristics of Adult Peripheral Blood Mononuclear Cells Differentiating into Early and Late Endothelial Progenitor Cells In Vitro. J. Clin. Rehab. Tissue Eng. Res. 11, 2007: 4682–4685. 2 Shang H, Zhao G, Yang L. Differentiation of Human Peripheral Blood Mononuclear Cells into Hepatocyte-Like Cells In Vitro. J. Clin. Rehab. Tissue Eng. Res. 13, 2009: 1859–1863. 3 Tumaini B, et al. Simplified Process for the Production of Anti–CD19-CAR–Engineered T Cells. Cytotherapy 15(11) 2013: 1406–1415. 4 NCT01626495. Phase I/IIA Study of CART19 Cells for Patients with Chemotherapy Resistant or Refractory CD19+ Leukemia and Lymphoma. Children’s Hospital of Philadelphia, October 2014; https://clinicaltrials.gov/show/ NCT01626495. 5 Kochenderfer JN, et al. Chemotherapy- Refractory Diffuse Large B-Cell Lymphoma and Indolent B-Cell Malignancies Can Be Effectively Treated with Autologous T Cells Expressing an Anti-CD19 Chimeric Antigen Receptor. J. Clin. Oncol. 32, August 2014; http://jco.ascopubs.org/content/ early/2014/08/25/JCO.2014.56.2025.full.pdf. 6 Brusko T, Atkinson M. Treg in Type 1 Diabetes. Cell Biochem. Biophys. 48(2–3) 2007: 165–275. 7 Beres AJ, Drobyski WR. The Role of Regulatory T Cells in the Biology of Graft Versus Host Disease. Front. Immunol. 4(163) 2013; www.ncbi.nlm.nih.gov/pmc/articles/ PMC3690651. 8 Desreumaux P, et al. Safety and Efficacy of Antigen-Specific Regulatory T-Cell Therapy for Patients with Refractory Crohn’s Disease. Gastroenterol. 143(5) 2012: 1207–1217. 9 Laborde RR, et al. Cancer Vaccines in the World of Immune Suppressive Monocytes (CD14+HLA-DRlo/neg cells): The Gateway to Improved Responses. Front. Immunol. April 2014; http://journal.frontiersin.org/ article/10.3389/fimmu.2014.00147/full. 10 Sambor A, et al. Establishment and Maintenance of a PBMC Repository for Functional Cellular Studies in Support of Clinical Vaccine Trials. J. Immunol. Meth. 409, 2014: 1107–1116. 11 Bull M, et al. Defining Blood Processing Parameters for Optimal Detection of Cryopreserved Antigen-Specific Responses for HIV Vaccine Trials. J. Immunol. Meth. 322, 2007: 57–69. 12 Mozzini C, et al. Increased Endoplasmic Reticulum Stress and Nrf2 Repression in Peripheral Blood Mononuclear Cells of Patients with Stable Coronary Artery Disease. Free Rad. Biol. Med. 68, 2014: 178–185. 13 McKenna KC, et al. Delayed Processing of Blood Increases the Frequency of Activated CD11b+ CD15+ Granulocytes Which Inhibit T Cell Function. J. Immunol. Meth. 341, 2009: 68–75. 14 DeRose R. Granulocyte Contamination Dramatically Inhibits Spot Formation in AIDS Virus–Specific ELISpot Assays: Analysis and Strategies to Ameliorate. J. Immunol. Meth. 297, 2005:177–186. 15 Ducar C, et al. and the NIAID HIV Vaccine Trials Network. Benefits of a Comprehensive Quality Program for Cryopreserved PBMC Covering 28 Clinical Trials Sites Utilizing an Integrated, Analytical Web-Based Portal. J. Immunol. Meth. April 2014. 16 Nazarpour R, et al. Optimization of Human Peripheral Blood Mononuclear Cells (PBMCs) Cryopreservation. Int. J. Mol. Cellular Med. 1(2) 2012: 88–93. 17 Deller RC, et al. Synthetic Polymers Enable Non-Vitreous Cellular Cryopreservation By Reducing Ice Crystal Growth During Thawing. Nature Communications 5(3244) 2014. Mars Stone is a staff scientist at the Blood Systems Research Institute and in the UCSF department of laboratory medicine; www.bsrisf.org. Karla Murcia, Melanie Dimapasoc, and Bonnie Yip are research associates at the Blood Systems Research Institute. Corresponding author Maria Thompson is vice president of scientific affairs (1-415-785-8516 x119; maria@biocision.com); Eric J. Kunkel is senior vice president of research and development, Brian Schryver is vice president of product development, and Rolf Ehrhardt is chief executive officer of BioCision LLC, at BioCision, LLC, 101 Glacier Point Road, Suite E, San Rafael, CA 94901; www.biocision.com.